On the 19th of June, 1907, John B. Shill, the second Shill family member to come to Canada, boarded the Lake Champlain in Liverpool along with 1336 other passengers. Bound for Quebec City and Montreal, the ship arrived in port on June 30th, 1907, at 9:25 am. Two days later, the Lake Champlain arrived with another boatload of immigrants who would contribute to the development of our country. Images of the ship's original passenger list found on www.ancestry.ca provided the data for the statistics given below. An effort has been made to be as precise as possible. Of all 1337 passengers on board the Lake Champlain, 74% (993) claimed England as their place of birth. Add to these the 144 Irish-born, 27 Welsh, 20 Scottish, 1 from the Isle of Man and another from Jamaica, not forgetting the 11 Canadian-born, a total of 1197 passengers (almost 90%) could claim British origins. Of the 1127 Canadian-bound passengers, 79% came from England. If you include all countries under British rule, 95% of the passengers bound for Canadian destinations were British-born. These statistics differ markedly from those for US-bound passengers on the ship. A mere 13% of US-bound passengers hailed from England and only 20% were British-born. Interestingly, of the 211 passengers headed for the US, 71 (34%) were from Finland, 31 and 32 were from Sweden and Norway respectively (about 15% each). 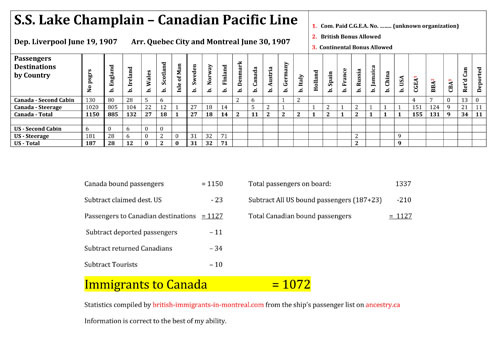 Presumably, most passengers headed for the US would not have chosen a ship stopping in Quebec and Montreal. The vast majority of passengers on the Lake Champlain in June 1907 (1127 or 84%) headed for Canadian destinations. 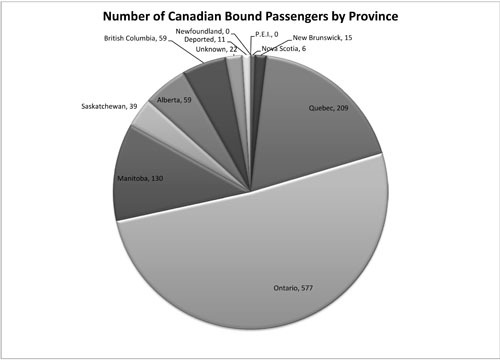 The following pie chart shows the relative numbers of passengers destined for each Canadian province. To see a detailed breakdown of the towns and cities that passengers stated as their destinations in each province, click here. To see an alphabetical list of the passengers of British origin who gave Montreal as their destination click here.